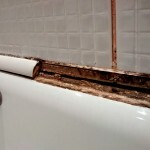 Over Time, trim tiles on a bath set with grout can loosen and once this happens water will penetrate behind. 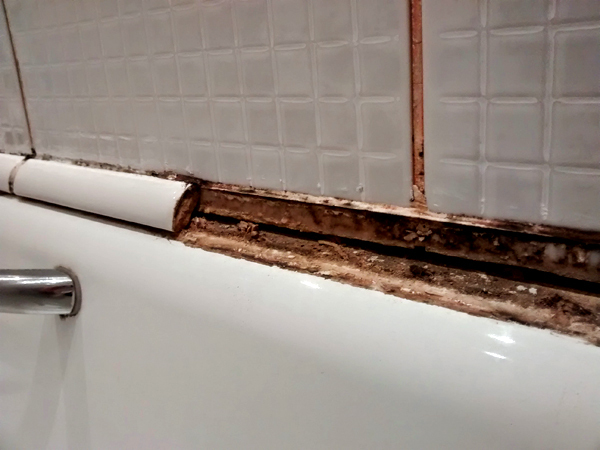 Because of the movement of a bath being filled and emptied and the combination of water loosening the tiles it won’t be long before they will just fall off. Water behind the tiles will also effect the wall behind and in more extreme cases the neighbours downstairs. In this instance the tiles came away very easily and the adhesive underneath was very soft. Once all the residue had been removed and the edges of the bath and tiles polished and dried new silicone could be applied. A thick bead of silicone on a 45Deg angle allows the silicone a good grip on both the bath and the tiles which is important with all the movement. Bath with new silicone applied in place of old trim tiles. For the Basin there was some mouldy silicone in place. This was removed and the basin and tiles again cleaned and polished. A new bead of silicone was applied, in this instance a smaller 45deg bead as the basin does not undergo as much movement, and does not get subjected to the same volumes of water. 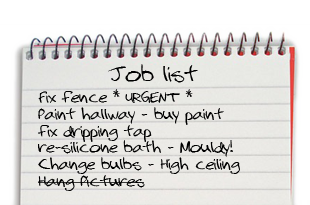 This entry was posted in Bathroom, General Maintenance, Repairs and tagged bath, Bathroom, Grout, maintenance, repair, rotten, shower, silicone, Tiles, wall. Bookmark the permalink.